Dr. Sebastian Gorka discusses his new book, Why We Fight: Defeating America’s Enemies – With No Apologies, America’s greatest national security threats, birthright citizenship from the perspective of an immigrant, Trump’s job performance as President, and the 2018 Elections. 2:52 Dr. Gorka talks about his new book Why We Fight, his expanded focus compared to previous bestseller Defeating Jihad, and why he wrote the book in general. 6:16 Dr. Gorka explains why Whittaker Chambers, his classic book Witness, and his historical example are so important for conservatives today. 11:32 Dr. Gorka explains the ideology and inspirations behind Pres. Trump’s America First foreign-policy doctrine, encapsulated by the USMC motto “No better friend, no worse an enemy”. 13:50 Answering a question from the CBC Facebook page, Dr. Gorka reveals which country poses the greatest threat to America, and his plan to defeat them! 16:55 Answering a third Facebook question, Dr. Gorka explores the Middle Eastern situation for America, and the effects Trump’s overtures to Israel have on the region and its politics. 21:45 Dr. Gorka addresses the idea of birthright citizenship, the 14th Amendment, and President Trump’s proposal to alter or eliminate birthright citizenship altogether. 23:04 Dr. Gorka gives his predictions for the 2018 midterms, including whether or not the GOP will maintain control of the House. Dr. Gorka, at one time deputy assistant to Trump, is an expert on national security, strategy, and counterterrorism. He holds the Major General Matthew C. Horner Distinguished Chair of Military Theory at the Marine Corps University. 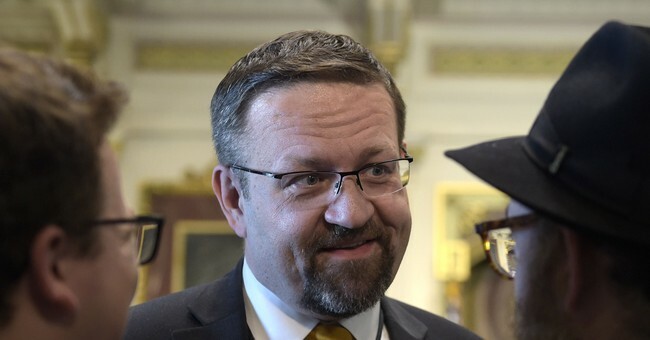 A Breitbart News contributor and frequent guest on the Fox networks as well as the BBC, CNN, and Sky News, Dr. Gorka is the chairman of the Threat Knowledge Group and a recipient of the Joint Civilian Service Commendation, awarded by U.S. Special Operations Command. How can we win today’s global conflicts in an era of renewed geopolitical rivalries with other major powers? Dr. Sebastian Gorka tackles this essential, existential dilemma, turning to Sun Tzu and American heroes Stephen Decatur, Chesty Puller, “Red” McDaniel, and Whittaker Chambers for answers. With liberals unable and unwilling to believe in or fight for American values and with America reeling after 8 years of Obama’s ineffectual foreign policy, Dr. Gorka reminds readers that national willpower, not just weaponry, wins wars. Within Why We Fight, Dr. Gorka answers four key questions: what are the most serious threats to American security, how are they different from the threats of the past, what can we do to counter these threats, and how can we achieve the “perfect victory” of vanquishing our enemies without mortal combat? Dr. Gorka’s Defeating Jihad, including a free sample chapter! VIP members, make sure to check out the free Defeating Jihad audiobook HERE!